The Pfeiffer Ridge Fire wasn’t quite that nightmare scenario, but it was close. 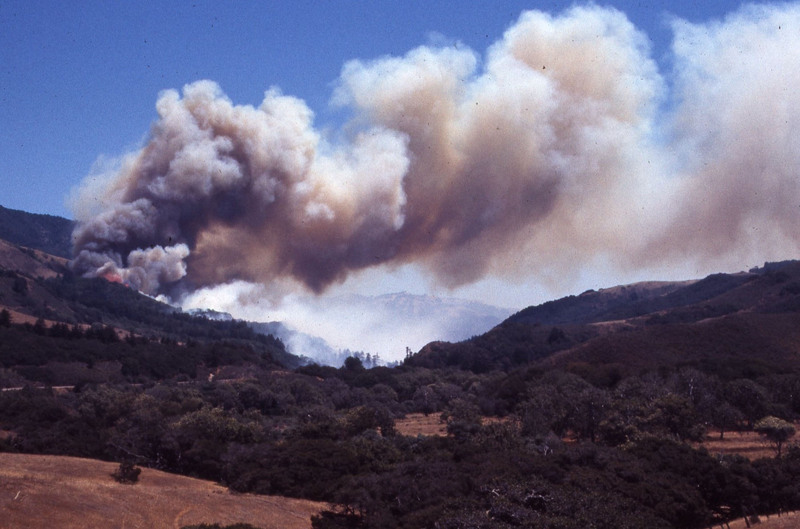 Like the explosive Molera Fire, in 1972, it started along the Highway and reached inhabited areas so quickly that those closest to the fire front had only minutes to choose between fleeing for their lives or staying on to fight with whatever resources they happened to have on hand. It could easily have been worse. While the woods are obviously dry enough to burn, they were even drier a month or two ago. If the fire had broken out in September or October, or if it had been pushed by harder wind, it could have moved more quickly, making escape or successful defense in place much more difficult. It could also have happened in a neighborhood lacking good escape routes, or where fewer people have created defensible space around their homes. Defensible space, as this fire dramatically demonstrated, doesn’t guarantee a home’s survival. It may protect a home from direct attack by the flames of the fire front, but it cannot protect against showers of burning embers. Only fire resistant construction and constant maintenance can help with that. Still, defensible space does make a home much more likely to weather a fire and, more importantly, makes the survival of anyone forced to shelter there much more likely. Check out this photo of a wall set on fire by an ember caught in a wreath. The Molera Fire was started by an illegal campfire, and this fire likely started the same way (although a cause has not yet been officially determined). Does this mean the recent lifting of Level IV fire restrictions (which banned flame of any kind in the National Forest) is to blame? Probably not, since fires are always prohibited in the area where this fire ignited and, like the vast majority of the public, the person who lit it is unlikely to have heard of the Forest Service action, let alone been confused by it into thinking that lighting a fire across the street from the Big Sur Lodge would be OK. The fire showed that lifting the Level IV restrictions was premature. But how much good do the restrictions actually do? When we took a walk out to Sykes Camp last month (with the restrictions in full effect), we found cigarette butts in the trail and dozens of campfire rings that had held fires the night before. What this suggests to us, other than that backcountry fire scofflaws seem to be better at keeping their fires contained than those who build fires along the side of the Highway, is that the Forest Service really needs to do a better job of getting the message out about fire restrictions and of getting out from behind their desks and patrolling the backcountry. That wouldn’t do anything to prevent fires like this one, though. While the person who started the fire was obviously being very, very stupid, chances are they didn’t actually intend to set the woods alight. We can’t help wondering whether things would have turned out differently if they’d simply run across the road to the Lodge and immediately reported it. We’ll never know whether the fire could have been stopped before starting its run to the top of the ridge, but there’s little question that a quick report would have bought more time for firefighters to position themselves in the Pfeiffer Ridge neighborhood – something that would likely have saved more structures. Trouble is, it’s all too easy to slip away into the night and, given the potentially (and understandably) severe punishment awaiting those who negligently start fires, the incentive to disappear is strong. It’s often said, when homes are lost to fire, that property can be replaced. Yet, homes grow to reflect the people who live in them. Over time, they become irreplaceable repositories of memory. When an old family home burns, much more is lost than boards, glass and personal possessions. Lifetimes of memories lose a bit of their solidity, drift a little further from reach. New homes await their own ghosts. The old ghosts are forever gone. Yet, fire or no, all human works are impermanent. Memories too. Perhaps if we let the fire remind us of the wonder and miracle of our ephemeral existence, we can gain something truly valuable from it. Please make donations to help those who have lost their homes through this local site. This entry was posted on Friday, December 20th, 2013 at 4:17 pm and is filed under Big Sur, Fire, Flood & Apocalypse, Santa Lucias. You can follow any responses to this entry through the RSS 2.0 feed. You can leave a response, or trackback from your own site. XT, as always, right on! I always enjoy your thoughts and experiences about our wilderness, area, fires, floods, and all. Your knowledge is unsurpassed. Thank you.